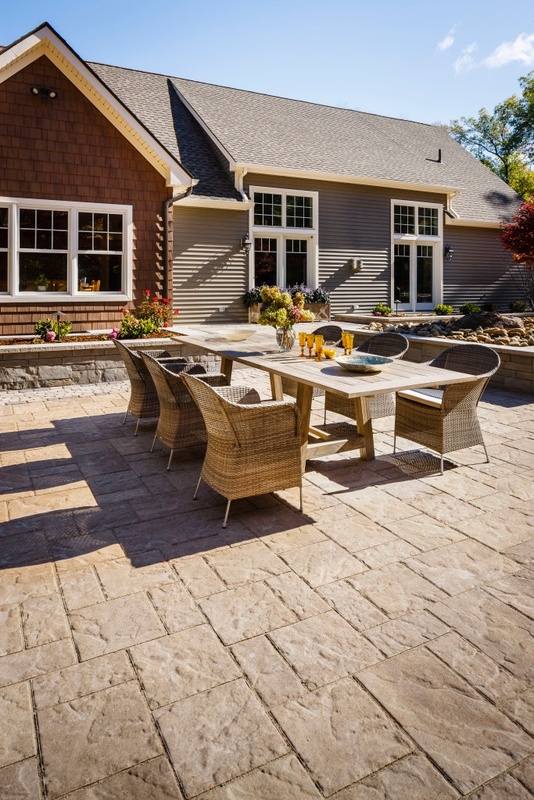 This project, situated near Hartford, CT, was designed by Techo-Bloc for its 2016 Contractor Showcase feature and was installed in collaboration with the Bahler Brothers of South Windsor, CT. It took a team of 8 men a total of 1500 man-hours to complete the 5,300 sq. ft. job. The objective was to create a multi-functional and intimate Country Rustic space with large, multi-generational, family gatherings in mind. This meant respecting ADA compliance when it came to slope percentages and wheelchair accessibility. It also meant that various activity-based areas needed to be established organically and effortlessly. Creating this large paved surface so close to the home for ease of access required incorporating a sophisticated storm water management system. With deep window wells and the foundation to consider, excess water needed to be channeled in the right direction. In terms of design, the bare and flat context of the land needed to rise up and match the scale and height of the house, as well as tie in the country feel of the home’s exterior design. Considering the expansive 13-acre wooded property, ensuring that the result was intimate and functional was a challenge. Techo-Bloc and the Bahler Brothers rose to the occasion. Close attention was paid to foundation depth and the permeability of certain zones near the home. The base itself was entirely permeable; open-graded aggregate was used throughout. This strategy had the advantage of directing water downwards and away from the foundation, while also being self-consolidating. When the appropriate open-graded aggregate is correctly compacted, a balance between density and water drainage capacity is achieved. In other words, water is less likely to remain trapped in the aggregate, decreasing frost heave and secondary compaction rates over time. Where they wanted water to move rapidly away from the home, surfaces were made impermeable by using polymeric sand in the joints. Further away from the home, the joints transitioned into permeable ones, allowing for water to drain into the base gradually from a controlled point. To top it all off, they installed a rainwater collection system that captured this runoff and recycled it into the irrigation system. To respond to the scale of the project appropriately, the team built up the landscape with vertical elements in order to balance the height of the house. 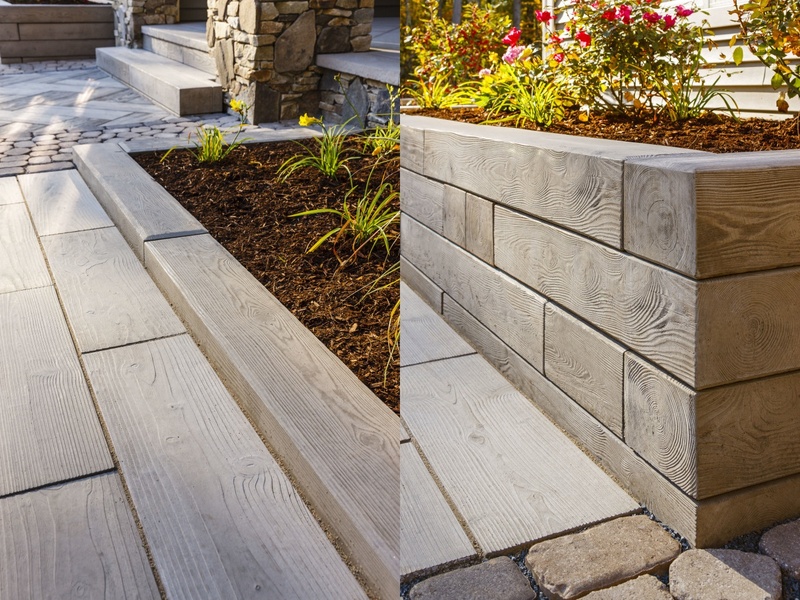 Techo-Bloc’s wall systems were used to create functional surfaces and structures such as raised flowerbeds, columns, fire features and even outdoor kitchen features. A sizeable pergola to shelter the outdoor kitchen was constructed of solid wood, adding intimacy to the yard. 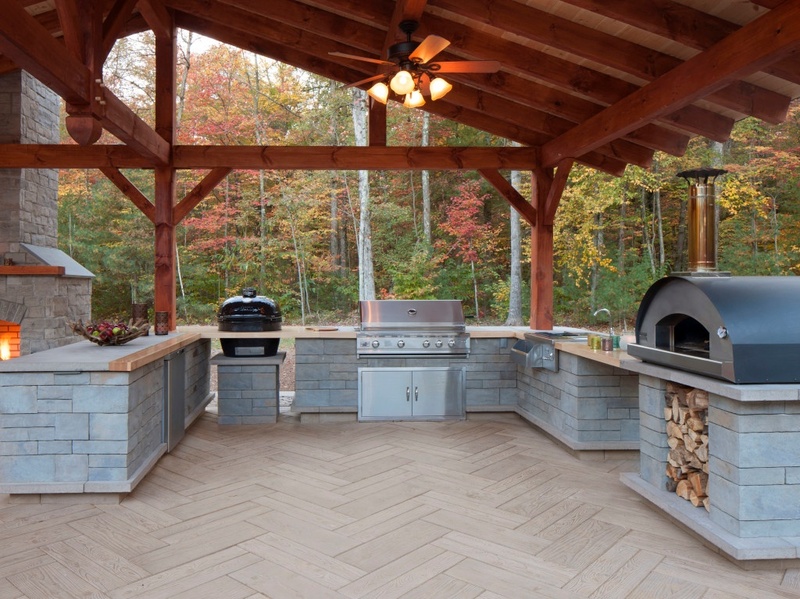 To address the entertainment requirements, a custom outdoor kitchen was built. Equipped with a sink, fridge, grill, barbecue, burners, smoker, and Techo-Bloc pizza oven, no culinary experience was left out of bounds. The adjacent fireplace and dining area were designed to provide ample room for entertaining while cooking, and the second fire pit, further from the main pavilion, was built as a cozy retreat. These spaces were meant to be versatile and distinct, all while communicating a sense of togetherness. Selecting the right product for the right project means more than showcasing design skills. It means knowing which products will provide maximum flexibility and efficiency. Color and texture matching is important but understanding a product’s workability is what sets a professional apart. This project was no exception: products were selected for their aesthetic attributes, flexibility and technical specifications. 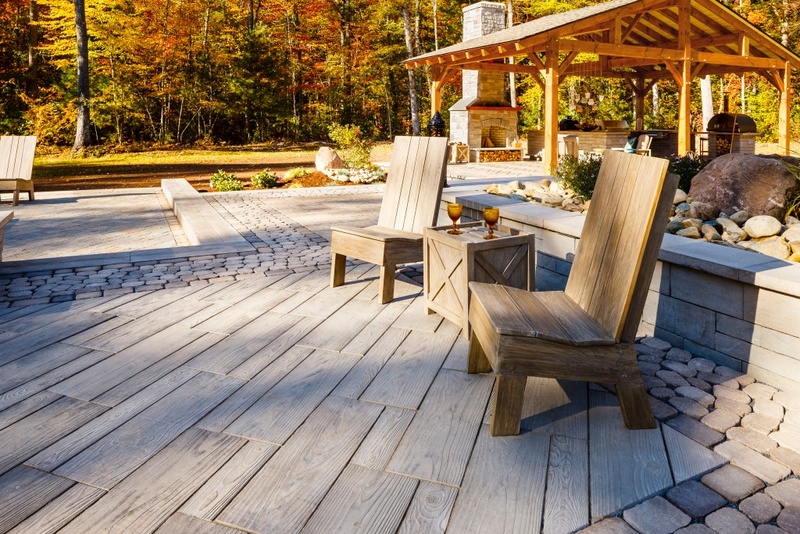 The not-so-secret ingredient is Techo-Bloc’s Borealis product line. Perfectly mimicking real wood, these durable concrete slabs, steps, edges, and walls are available in several colors and dimensions. The use of these products throughout the property complements the style of the home perfectly, all while eliminating the upkeep that wood decking involves. Borealis slabs were installed in different patterns to create visual interest with a soft combination of colors. Antika and Villagio cobblestone-style pavers were selected for their permeability and their mosaic-like appearance in bandings and borders. Eva pavers were used in small areas, as their compact size makes them perfect for small-scale designs. Blu slabs were used to clad larger surfaces, as their greater dimension is ideal for large-scale applications. 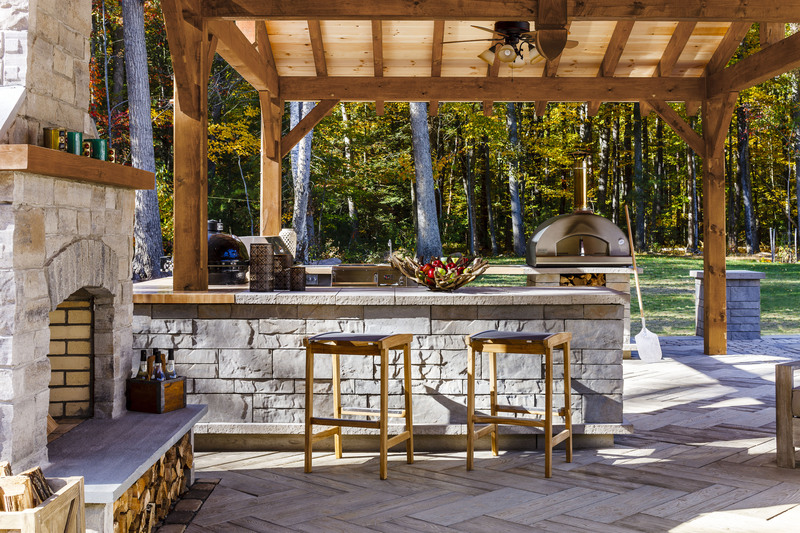 Techo-Bloc’s double-sided Brandon wall was selected for its sculpted look and for its versatility, while the interlocking mechanism guaranteed that the kitchen, fire features and walls were built quickly and efficiently. With a matching masonry line, fire pit kit and the ability to build kitchen features with limited cuts, the decision to go with this wall was easy. In this case, the fireplace was finished with Brandon bricks, allowing for this custom element to blend entirely with the rest of the project. The conclusion was simple: proper planning and appropriate product selection is crucial in avoiding complications in the short and long term. Whether we are talking about aggregates or slabs, understanding your options, knowing your products and how they work, are the keys to success. 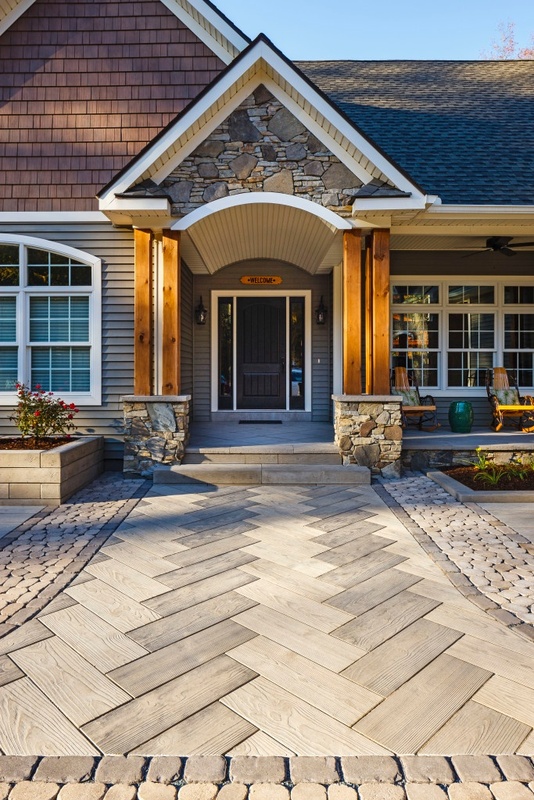 These are the kind of subjects that Techo-Bloc’s Showcase seminars aim to discuss; real-world technical applications and design strategies that are geared towards efficiently answering a homeowner’s needs. If this kind of discussion interests you, check out www.techo-bloc.com/register to find a Showcase near you!